For the past decade, we’ve seen marketing trends come and go. But there is one type of content that has paid off time and time again that flies under the radar: original research. Before we go further, let’s get on the same page about what we mean by original research. I’m not referring to market research you use internally to help you make better decisions (although this is super important). I’m referring to research you create and publish for public consumption. Research developed with the intent of getting attention, such as benchmarks, state of the industry reports, salary guides, etc. 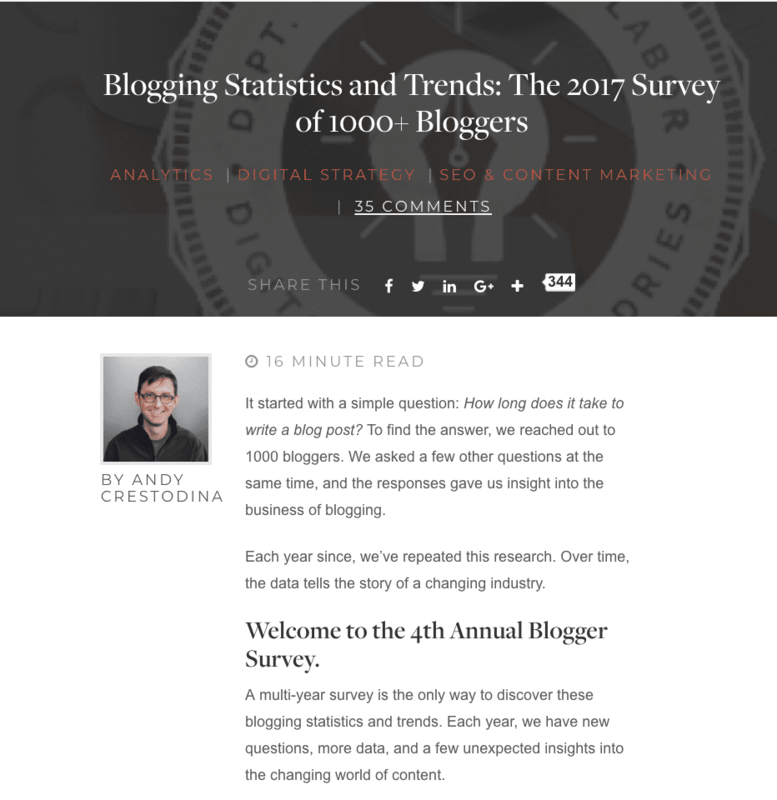 A great example: Orbit Media’s own Annual Blogger Survey. Maybe you haven’t considered research — or you are thinking research takes too much time and is too expensive (which is what one of my LinkedIn contacts recently told me). I could go on (and on) about why publishing your own research is a good bet for marketing teams and why it is surprising so few companies are using it — but here’s what you need to know: research works. It helps you get attention, establish yourself as a leader in your industry and build an audience. It’s one of those content tactics that truly breaks through the noise if you do it well. Take the research from Orbit I just mentioned. Not only did that study generate the most social shares of any piece of Orbit Media content over the last 12 months, but it also earned the most backlinks (which Buzzsumo calls linking domains, below). It’s an authoritative piece of content that works! To my friend’s point, yes, research can be time-consuming, but 1) it’s worth the effort, and 2) you can save a lot of time if you know how to approach the project. And yes, research can also be expensive, but it doesn’t need to be. Here are seven specific ideas on how you can create research that gets attention, even if you are on a tight budget. The best research combines valid, accurate data with a clear, compelling story that uses data visualizations to share insights in a new way. I’ve read data-heavy reports that are trying to convey so. many. things. As a reader, I’m overwhelmed and I don’t know exactly what to do with all of the data presented. What are some of the headlines you envision will support your research once it is published? Can you articulate the key focus of your research in 1-2 sentences? What will someone do with the data you present? How will it make their life better or easier? And, once you have answers to these questions, keep them front and center throughout the rest of the planning process. Keep data + story in mind from the start of your project because it helps you understand why each element of the process is important. So what story do you want to tell? What should your research focus on? Are there certain things you anecdotally tell clients and customers that you want data to back up? Are there questions your clients ask that you want to answer with data but can’t? Is there a specific niche you want to be known for and you want data that will help tell your story? Once you have some ideas on the general topic on which you want to focus, head to Google to see what research has already been covered in your space. Start by entering your industry / topic ideas in quotes and then add + research or + benchmarks. (You can also use the term such as “trends” or “state of,” but these may or may not be research-based results.) To look for current research, add a year. For instance, let’s say you provide email marketing services. 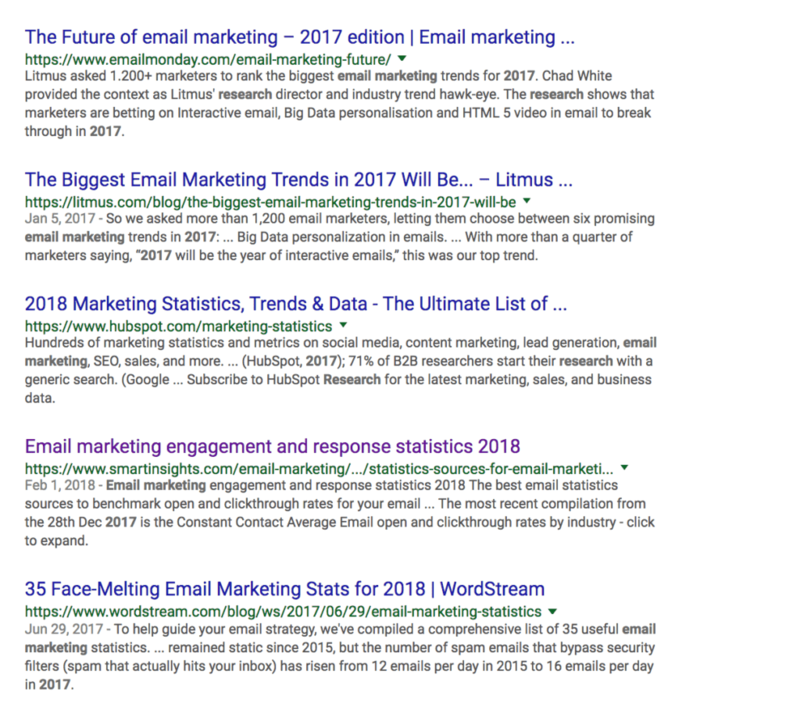 Search for “email marketing” + research 2017. After scrolling through the paid listings, you’ll see a slew of results such as these. Tip! To uncover even more research, look at the video and images tabs as well. Sometimes, you’ll uncover a lot of research in your space. Unless you have a need to validate common trends, your goal is to find a more specific topic in which you can be the source of info that will also help your company tell its story. Because there is so much research about email marketing and it may be tough to break through, you may decide you want to dig into another topic. You could niche down to the topic of autoresponders and learn how marketers are using them, why people are — or aren’t using them, what the best ways to use them are, etc. On the other hand, you may find there is little research on the topic. In this case, you may have an opportunity to use research to establish benchmarks of that industry in general. Yes, this is an article specific to the budget-conscious individual, but there are a few things on this list where it makes sense to invest. And one of them is survey design. And here’s a confession: even though I have been involved with survey design for years, I still run my surveys by our data scientist to ensure they’re designed for maximum effect and accuracy. I’ve reviewed many surveys, and one thing I constantly ask is, “How are you going to use the data from this question? What story are you going to tell?” If you don’t know how the answer to any question will further your story, chances are, you don’t need the question. Note! The only questions to which this does not apply are demographic questions that ask about the type of company you work for, etc. Of course, it hopefully goes without saying that you don’t know what data will be returned, and the story you hypothesize telling, may shift once you see the results. But that’s a story as well! The issue with asking too many questions — or questions that are too complicated to answer — is that people will stop answering your survey before the end. If your questions are poorly worded, you may find you can’t use the results and will need to remove that question from your analysis. Knowing the types of questions you will ask will also drive the type of survey tool you’ll need. There are many survey tool options — and various levels within those tools. For instance, you may decide if you to ask, “Are you a blogger?” Those who answer yes will be presented with one set of questions — and those who answer no will get a different series of questions. This is a common way to execute a survey, but not all tools support this type of survey logic, so it’s important to know what you need at the outset. Before you deploy any survey, it’s imperative you test it with a small group of people. Many survey tools offer the option for people to offer feedback directly. Here is the thing to remember: You need to spend time on survey design so you have solid data. Without data that is valid and accurate — that also tells a compelling story — it will be very difficult to get the attention you desire. When you’re considering survey-based research, you need one of two things: access to a good list or a budget to get access to a good list. We’ve already established that this post is for the budget-conscious, so let’s focus on how to get access to a list. If you don’t have a decent list, you’ll need to find a partner who does. Now, this may not be easy — or quick — but it’s definitely possible. And it’s another way to do collaborative content Andy talks about. And, it makes the project more fun! My business partner, Clare McDermott, and I are starting a new venture and we don’t yet have a list. Nada. So, we partnered with someone who did (thanks, Buzzsumo!). We are creating co-branded research on a topic that aligns with both of our brand stories. It’s important to note that we had a relationship with Buzzsumo before we approached them with this idea — and we had a plan on how to publish this survey in a way that appreciated their guidance yet took the bulk of the work out of the hands. In short, think about the relationships you have and see if there may be a way to join forces to collaborate on a research project. Once your report is ready, there are several things you want to do to help it get the attention it deserves. The first thing is deciding on a home base for your report. Said another way: where is the one spot you want to point all of your traffic to? Here’s something you don’t want to do if you want your research to get attention: make it a PDF. It’s not easy to track what is happening with it and it’s not a great experience for your reader. Publish one big, bad blog post that covers your research findings. Here’s a great example from Orbit’s own blog: Orbit Media’s 4th Annual Blogger Survey. As you will see, the post is quite comprehensive and provides details on every question. I chatted with Andy about this approach soon after he launched it, and he explained that this is an ideal way to release research because it helps your research rank well. 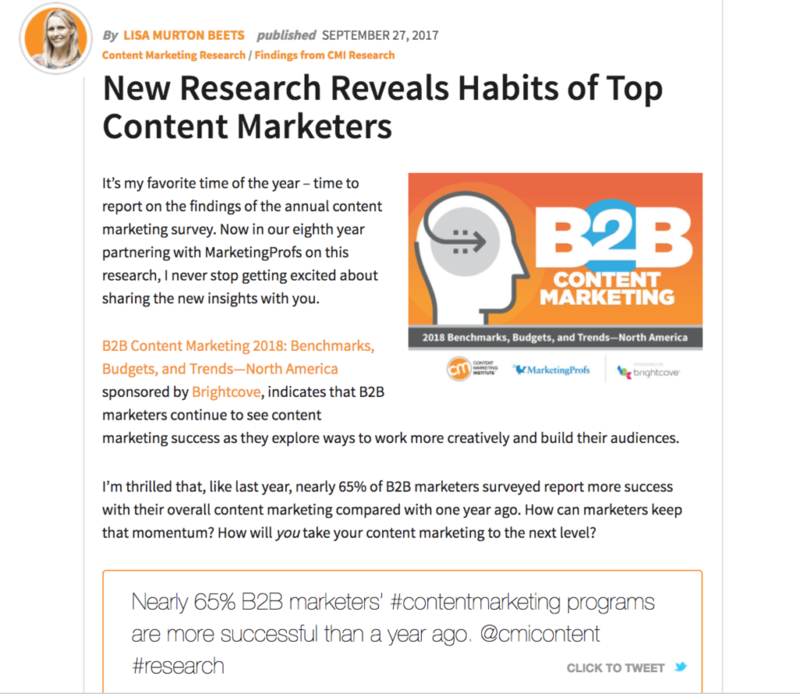 Here are 5 other ways they use original research in their content marketing strategy. Tips! Include the survey questions in your blog post to increase the likely hood your blog post will be included as a featured snippet. To increase the possibility of shares, include quotes from industry influencers. Many organizations gate their research. There are pros and cons to this . .. but that’s a story for another blog post. I like this example from Prophet from Altimeter for a few reasons. The landing page explains the study’s demographics and offers an executive summary of key insights so readers can make an educated decision about whether to download the full report. Altimeter also includes a section in each report that details related resources, such as a report preview, shareable graphics from Flickr, and information about how to engage Altimeter. One option you may not be thinking about is an ungated landing page, but this is a great option for housing all of your assets. This example if from Upwork is beautiful in its simplicity. I love that all materials are easily accessible — and you can easily toggle between years. The last type of “home” to consider for your research is more ambitious and isn’t something you’ll likely accomplish during your first year(s) doing research. But, we all need something to aspire to, right? I consider PwC’s hub for it’s annual CEO study, now in its 21st year, to be the gold standard of how to present research online. Of course, you can download the full report on their hub, but you can also view a video of the findings, get an overview of key trends and read more related content . . . and that’s just for the global report. You also have the option to select to view the content by specific countries — and each of these countries presents you with a customized landing page. As you develop your timeline for your research project, remember to leave anywhere from a few days to a week to pre-release the research to key influencers under embargo (i.e. a period of time in which people have access to the report before it is published). When you release something under embargo, your research findings take on a whiff of exclusivity as only certain people are getting access to your report. But, even better, you are giving these influencers time to cover your research. And, many influencers are interested in covering research because it checks many boxes: Trends, check. Timely, check. Relevant, check. A visual component, check. Amanda Subler published a fantastic template you can customize and send to influencers. The beauty of this template is that it simplifies the findings and makes them easy to share. Amanda suggests conducting 1:1 outreach, which takes more time, of course, but it also provides better results. Another mistake we often see is that people stop once the research is complete. “Welp, that’s one more report for the books . . . “ There is a tremendous opportunity to create additional, related content from your existing data. We also created content that addressed pain points identified in our research. 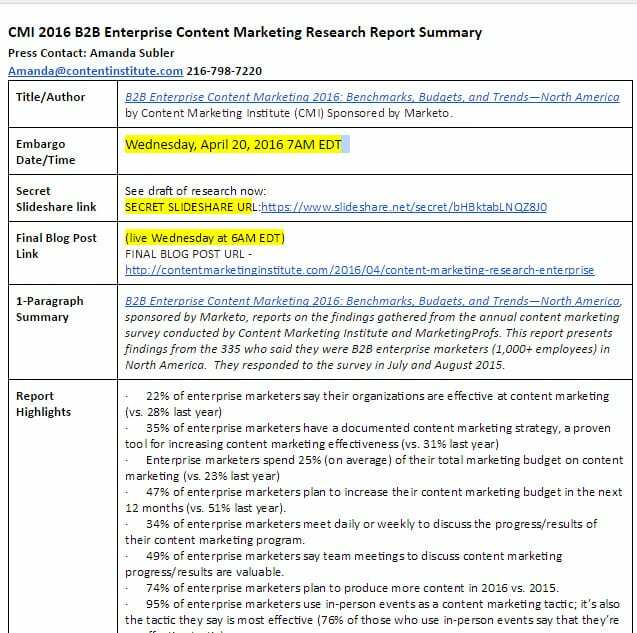 For example, we created a guide explaining how to document your content marketing strategy because we found this topic to be one of biggest factors between successful content marketers and their less successful peers. Whenever we talk about the need to document your strategy, we can point to this guide. It has been downloaded thousands of times! As you develop your next research project, keep these ideas in mind so you can use your time — and budget — most efficiently and effectively. And let me know what questions you have about research in the comments below. Michele Linn is the co-founder and chief strategy officer of Mantis Research, a consultancy that helps marketers publish and amplify original research. Before starting Mantis, Michele was the head of editorial at Content Marketing Institute. 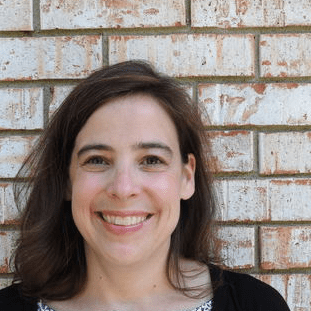 Connect with her on Twitter or LinkedIn. An original thinker I love it! This is a 2fer Michele so I’m going to add 2 comments. I have stumbled over some data without truly realizing its value until I read this post. Long story short I built an online exam with software that I rent. I sell a exotic bird supplies – I do not sell birds. I’m a blogger and I answer the phone after 15 years is easy to see why so many captive bird keepers fail and rehome their pets. I had a different purpose in mind when I built the exam but time constraints force me to repurpose it because I knew it had too much value languishing. The exam asks 44 questions mostly multiple-choice but six or a true or false all about what one knows or doesn’t know about caged bird keeping. The software grades the test and issues a diploma as well as indicating which questions were answered correctly and incorrectly. Only about 25 people passed the test with a passing score of 70% – the bar wasn’t real hi. I’ve had dozens of people reach out to thank me that despite of not passing the test it was quite an eye-opener and helped them rethink their own animal husbandry issues. But now you’ve come a long and I have all the results from 206 exams. I can easily knock out 1000 more words talking about the test but how best you think I should frame the results? Charts? Spreadsheets? I love that you are thinking about how to repurpose data you already have. There are a lot of things you can do with the data. As you think through your plan, look at the data but also focus on the story you want to tell. The story ultimately needs to take center stage with the data supporting it to make it even more compelling. As you mention, one possible story could be around how very few potential exotic bird owners have the right knowledge to offer the best care. This could be the crux if you big post. Or, if you are looking for many blog post ideas, consider a very general model of one blog post per question or group of questions. You could report the results for that question / those questions and then offer education on that topic. Depending on how long you have been collecting the data and how much you have from each chunk of time, you may also be able to look at trends. Has there been any change over time or is the knowledge people possess pretty static? Those trends could also make good jumpoing off points for blog posts. Good luck with your project — and let me know if you have other questions. Selling pet supplies the world of Amazon and Petco requires creativity, among other things so I’m always looking for issues that will set me apart. There’s only one species of dog (you can Google it) but there’s 9000 and 10,000 species of birds depending upon we read. We care for about 750 species that are held captive as pets. One of the things I learned early on when I got into this business in 2002 was that a certain type of parrot called the Eclectus parrot (Australia) has an elongated digestive system. The eclectus has an unusually long digestive tract, so tolerates a high-fiber diet. In captivity, the eclectus parrot does benefit from a variety of fresh fruits and vegetables, leafy greens such as endive and dandelion, and a variety of seeds, including spray millet, and a few nuts such as shelled almonds and walnuts. Ecelctus parrots have a longer digestive tract than other bird species, and some aviculturists believe that because of this, they especially need a low-fat, high-fiber diet that is not overly fortified with vitamins and minerals. I was looking at a bag of bird food with a picture of an Eclectus – the bag said all natural vitamins and supplements. We spent an hour (today) on the phone and she walked me through many of the surgeries she's performed. How many times she tracked the time it took for barium to travel from the birds crop to its poop shoot. Based on her 25 years experience in veterinary medicine and the face of one of the leading pet food brands in the country, I'm convinced – this long digestive tract issue is urban myth. Where or how would I start to research something like this so I can change the Internet (one of my hobbies) and build more content? I love this insight into a world so new to me. I wish I could give you some good tips about designing the study you have in mind, but I’m afraid that someone in that field specifically would be a much better resource. Let us know how you fare! And be sure to share if you end up doing something with all that exam data! Great point about backing up research with a story – while actual data and the conclusions you draw from the research are undoubtedly very important, publishing it in an easily digestible format is what will keep readers scrolling. And what will get you the links as well. While stats are share-worthy, the story is key!